The Black Sunglasses have a classic, elegant look while protecting your eyes from harsh sunlight. 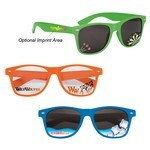 Imprint your company’s logo on the sunglass to attract immense visibility for your brand’s value and image. The Bottle Opener Malibu Sunglasses combines the utility of a bottle opener with that of a pair of sunglasses, making it a win-win combo to promote your brand. 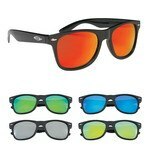 The glasses have UV400 lenses that provide 100% UVA and UVB protection. 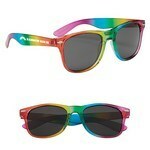 Use the Color Changing Malibu Sunglasses to make a fashion statement. The frame changes color when exposed to sunlight. The Color Mirrored Malibu Sunglasses are attractive and useful. 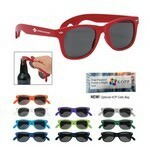 Emblazon your company’s logo on the fun and useful sunglasses to boost your brand’s popularity. Our Rainbow Malibu Sunglasses features UV400 lenses for total UV protection and allows adding brand logo to Promote your Brand. 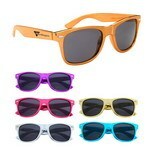 Take over the sports arena, the outdoor party, or the club, when you sport a pair of Dominator Glasses. 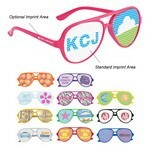 Attract attention to yourself and to the company’s logo printed on the eyeglasses. 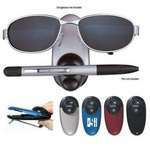 Keep your sunglasses in your range of vision, without carrying bulky cases, using the dual visor clip. Add your business logo to the visor clip, to enhance brand image. The Eyeglass/Sunglass Holder is an attractively shaped holder especially designed to hold your eyeglasses or sunglasses. 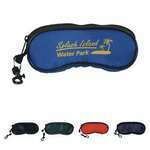 It is made using 420D nylon and has a zippered compartment. Imprint your company’s logo on the lens and the temple and showcase awareness about your brand using the Full Color Lens Glasses The frame is available in yellow, white, silver, red, gold, orange, neon pink, blue, black, purple, green, or glow in the dark colors. You can choose between a sunglass and a clear lens. Bright and attractive, the Full Color Lens Sunglasses can add subtle brand awareness when you imprint your company’s logo on the lens and temple. The frame is available in yellow, white, silver, red, gold, orange, neon pink, blue, black, purple, green, or glow in the dark. 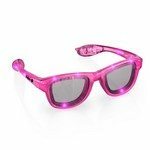 The LED Party Shade Sunglasses complement your outfit and are ideal for concerts, night events, and fundraisers. 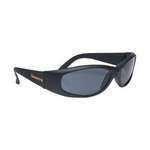 The Metallic Malibu Sunglasses are long lasting, attractive, and useful. 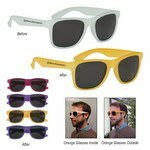 Emblazon your company’s logo on the fun and useful sunglasses and boost your brand’s popularity.